liability of transporters and freighters. After a general introduction analysing relevant aspects of trade mark and copyright law, local experts provide detailed reports on positions in the EU (at the Community level), Germany, France, Italy, The United States, Japan, Korea, Australia, and New Zealand. As well as dealing with the issues, each report pays close attention to case law, legislative developments, and procedural issues of injunctive relief and damages. A final chapter covers comparative contributory patent infringement. 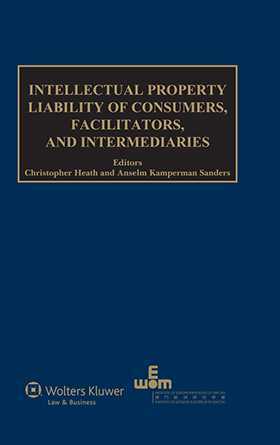 Along with the very practical value the book offers corporate counsel charged with IP rights litigation, the authors shed light on the fundamental issue of whether attempts to broaden liability in this area are compatible with established IP principles such as territoriality, freedom to operate, and freedom of competition. As a result, the book will be welcomed by a wide spectrum of lawyers and others working in this rapidly growing field, including practitioners, policymakers, academics, and jurists. Chapter 1. Comparative Concepts; A. K. Sanders. Chapter 2. Concepts under Common Law; D. Llewelyn. Chapter 3. The Position in Germany; J. B. Nordemann. Chapter 4. The Position in France; S. Nérisson. Chapter 5. The Position in Italy; A. Bellan. Chapter 6. The Position in the United States; I. Calboli. Chapter 7. The Position in Japan; T. Ueno. Chapter 8. The Position in Korea; Byung-Il Kim. Chapter 9. The Position in Australia and New Zealand; G. Austin. Chapter 10. The Case of Patents; C. Heath. General Index of Cases Sorted According to Jurisdiction.